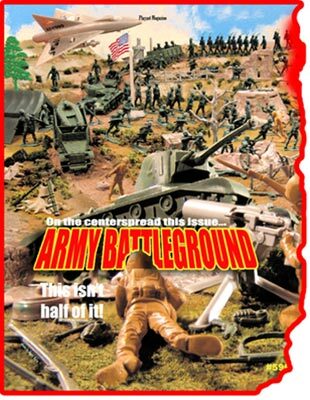 Our full color centerspread story this issue features the first of the Marx Giant Battlegrounds with over 300 pieces, and is very unique in the sheer numbers of maneuvering and marching figures, plus two sets of vehicles (none with the green wheel sets described in the Iwo Jima issue). We also have the Marx Bag Story, and this is information you can really use every day of your collecting! We expect to be updating this story regularily so get in on the ground floor with the best information the hobby has to offer! 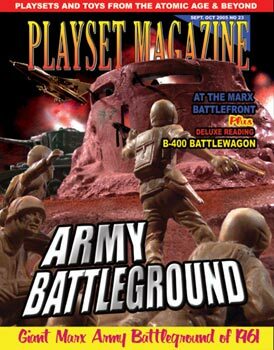 "If this playset was a movie, it would be one of those rocket-firing, airplane diving, bunker-exploding spectacles with thousands of guys where everything blows up at the end," writes PM publisher Rusty Kern. 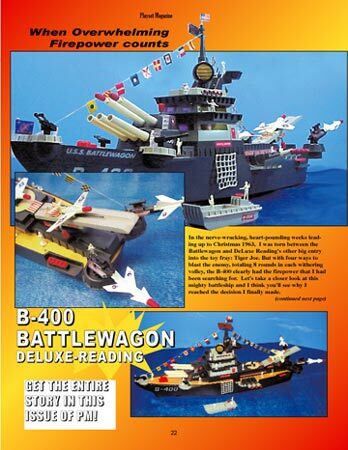 The Deluxe Reading B-400 Battlewagon gets color treatment as Jim Clouse delivers what is probably the most in-depth story ever published on this classic of the giant age of battery operated war toys. You'll never look at one of these weapons-laden beasts the same way as we "Sail the Living Room Floors" with her.